Welcome to the official website of Ronald Cooper! This site is a Multipurpose Interactive Resource Center(MIRC). The MIRC was started and is dedicated to offer accessibility, positivity, interactivity, and exceptional value to all of its guests. Exceptional value is presented in the form of compelling engaging life changing documented narratives, unique helpful services and products. Will you please allow me to introduce you to and briefly describe all the components of this site’s content? The first part addresses the Book and the central reason for writing it. The second aspect features my Speaking Services. The third segment focuses on Contest and Conversations. The fourth component is About the Author, and fifthly, how to Contact me. For a captivating, exciting, exhilarating, enjoyable, incredible experience, please watch this book trailer video now! 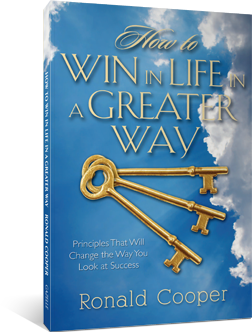 Discover proven results easy-to-apply principles from this unique book and start applying them today on your amazing life changing journey to winning in life in a greater way. Order now! This segement of the website provides provocative benefical time sensitive you-will-be-among-the-first-to-know of News&Events. News&Events which are revealing, interesting, factual, informative, illuminating, helpful and adds real value to your life. Here you will discover exclusive access to the official release and availability dates of new publications, products, and services. Additionally, important schedules will be available concerning special appearances. Special appearances including speaking engagements, book readings and signings and media interviews. Moreover, information in this department informs you concerning contests. Contests that you can enter for a chance to win valuable prizes with all the related details.